If you are not familiar with some of the terminology used, please see the Glossary of Terms. The domestic TTI broke through its long-term trend line generating a Sell for this area effective 8/9/2011. Over the recent past, we’ve seen the TTI hovering slightly below and above this dividing line between bullish and bearish territory. The clear break to the upside occurred on 10/24/11 and, effective 10/25/11, a new Buy signal for domestic equities went into effect. As of today, our Trend Tracking Index (TTI—green line in above chart) has bounced off its long term trend line (red) by +3.96% as part of the post election rebound. To avoid a potential whip-saw, a Sell signal to move out of all domestic equity positions will be generated once we have clearly pierced the line to the downside. Be sure to tune into my blog for the latest updates. The link below shows the top 100 domestic funds (out of 674) and the sorting order is by M-Index ranking. Prices in all linked tables are updated through 03/28/2013, unless otherwise noted. Price data not yet available at publication is indicated with 00.00% or -100.00%. 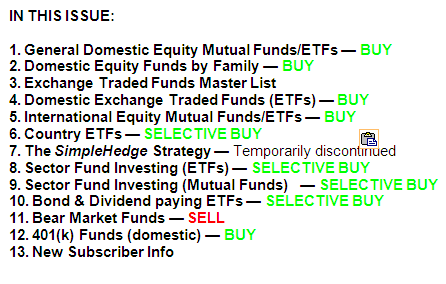 As per request, I have added this ETF Master list so that you can quickly compare various ETFs without having to reference other tables. The ETFs listed in the table (476) consist of the following orientations: Domestic, International, Country, Sector and Specialty. Momentum figures for all ETFs are not adjusted for dividends. Please note that I have moved all bear market ETFs to section 11, where they are listed alongside the bear market mutual funds. ETFs are an excellent alternative to No Load Mutual Funds. They are a valid choice to high mutual fund management fees, restrictive trading and redemption charges, which have been a problem for years. All the same Buy and Sell rules apply for domestic ETFs as they do for domestic equity mutual funds in section 1. This index gapped above its long term trend line to the upside and is now positioned at +8.13%. As always, I recommend you use my suggested 7% trailing sell stop in order to limit downside risk, should the trend reverse all of a sudden. Be advised that many international funds may not be available to you since they carry a load. However, while I am able to purchase these for my managed account clients as ‘load waived’ funds, this doesn’t help you much, if you do your own investing. This is why I have included some appropriate ETFs in the above list. While I believe that the United States is the greatest country in the world to live in, it is not necessarily always the best, or only one, to invest in. This addition to my newsletter will allow us to also invest selectively in countries with better performing stock markets. With the proliferation of ETFs over the past years, we are now able to invest in a variety of countries using low cost index ETFs. The link contains a list of various countries/regions, which I am tracking weekly. Please note that data in this table does not include adjustments due to distributions. As you witnessed during the last couple of years, country funds can be volatile and the use of a trailing stop loss (I use 10%) is imperative to protect your portfolio from severe downside moves. I personally invest no more than 5%-10% of portfolio value in any one sector and use a 10% trailing stop loss to minimize the risk. If you prefer using Fidelity’s wide variety of excellent sector funds, you will like this new addition. Here as well, sectors can be volatile, and I advise the use of a sell stop just as we do with ETFs. The above indicator represents our Short Fund Composite (SFC) to be used as a trend indicator for Bear Market Funds. The SFC has now broken below its long-term trend line by -10.53%, which means we are in bearish territory. As in the past, I will not take any action until the domestic TTI (section 1) has clearly broken into bear market territory. My preference is to work with a hedged position, or remain in cash/bonds, as opposed to an outright short one. Please note that some of the above funds try to outperform the index they are tied to by the percentage stated. 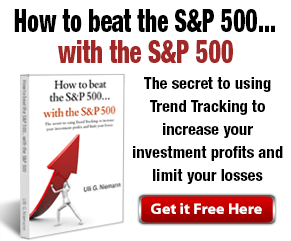 While this can enhance your returns it can certainly accelerate your losses as well. No matter which way you choose, be sure to work with a trailing sell stop and be aware that volatility will be your constant companion. The list (featured in the link below) displays commonly held 401(k) domestic equity mutual funds showing their latest momentum figures to go along with the Buy and Sell signals of the TTI in section 1. The same stop loss rules apply here as well. Since fund choices are limited in any 401k plan, be sure to roll your assets into an IRA if you leave your job. Let me know if you need help with that. In the meantime, however, you can benefit greatly by at least not buying the worst fund at the wrong time. If you follow our plan, you will never again buy one of those highly volatile sector funds, when you really should be out of the market altogether. The sorting order is now also by M-Index. (c) Copyright Successful-Investment.com, 2003. All rights reserved. No portion of the above message may be republished, retransmitted or forwarded without our express written consent. Violation of this copyright may result in service cancellation. Use and/or reliance on this service are strictly at the subscriber’s own risk. Subscriber must maintain compliance with our Terms and Conditions. We will not be liable for the acts or omissions of any third party with regards to delay or non-delivery of the ‘Successful-Investment’ notification. We shall not be liable for incidental, indirect, special or consequential damages or for lost profits, savings or revenues of any kind, whether or not we have been advised of the possibility for such damages. Ulli G. Niemann is a registered investment advisor pursuant to the California Department of Corporations. The information presented herein is for informational purposes only and does not constitute an offer to sell securities or investment advisory services. Such an offer can only be made in those states we have established a “notice-filing” status or where an exemption from notification is currently available under the de minimis exemption rule. This entry was posted in ETF StatSheet and tagged ETFs, Mutual Funds. Bookmark the permalink.